Laurie Gerard, Research and Development - Laurie Gerard is responsible for the research and development center at John Knox Christian School (JKCS). Many years ago, TechnoKids Inc. formed a partnership with the school community to have teachers test our instructional materials. This relationship ensures that the projects are developmentally appropriate, meaningful to students, integrate into the curriculum, and have clear instructions. Laurie works with the staff and students at JKCS to help them operate their technology program. Her duties include curriculum support, computer lab maintenance, and upkeep of the network and server. As a key member of the Information Technology Committee at the school she provides advice regarding the technology program. Her devotion to the school community and their technology program makes her an invaluable member to our team. Laurie's contribution to the blog includes entries about the challenges of integrating technology in a school environment. The technical issues she overcomes related to hardware, software, and networking will be passed on to you in the form of practical strategies. In addition, she writes about the real-world problems faced by a school as they struggle to offer a quality technology program with a limited budget. 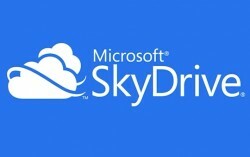 Are your students unable to print or download files from SkyDrive at your school? 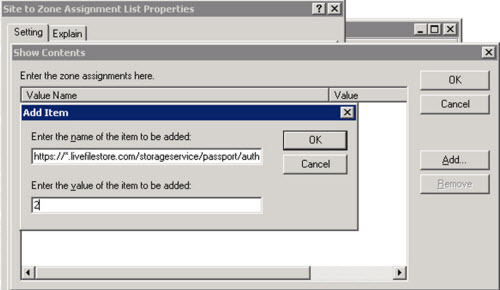 Ask your system administrator to adjust your group policy settings by adding several URLs as a trusted source. Please note, these instructions are written for Server 2003 (Yes, I know that’s OLD). If you have a newer server the instructions might be somewhat different, however the URLs will be the same. NOTE: THIS SHOULD BE DONE BY YOUR SYSTEM ADMINISTRATOR. You can open your Active Directory Users and Computers’ control panel by navigating to it on your Start menu by going to Program Files > Administrative Tools > Active Directory Users and Computers. If you want the policy to apply to your entire domain, right click at the top of the console. The domain is specified by an icon of three computers. If you want to apply the policy to another group or organizational unit right click on that instead. Click on the Group Policy tab and then click the Open button. This is called the Group Policy Management tool. The organizational unit you previously selected will already be highlighted. That will take you to the place where you can name the policy. Name it something that will make it easily identifiable. Then click OK.
You have just created your policy. Now you need to define the settings that you want to trickle down to your clients. Locate your policy in the right pane and right click on it. Choose Edit to get started. Now you need to drill down to the settings that you want to set. In the left pane, click the + sign to expand each group as follows: Computer Configuration > Administrative Templates > Windows Components > Internet Explorer > Internet Control Panel > Security Page and then double click Site to Zone Assignment List in the right pane as you can see below. 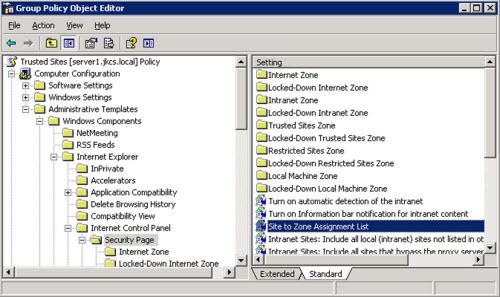 After you double click on Site to Zone Assignment List you will see a window to enable the settings and configure it. Click enabled. Then click Show. On the Show Contents screen, click Add. By clicking add, you add URLs and specify what zone you want them to be placed in. You can also add wildcards to factor in variations of the URL. Add the following URLs (one at a time) to allow your students to be able to view their SkyDrive documents as a PDF file, print the PDF, and download the Word file to their computer. Intranet zone – sites on your local network. Trusted Sites zone – sites that have been added to your trusted sites. Internet zone – sites that are on the Internet. Restricted Sites zone – sites that have been specifically added to your restricted sites. After clicking OK you can wait for the 15 minute default refresh of Group Policy or you can run gpupdate.exe from the Run command on any workstation to see if it worked. Optionally you can also restart the workstations to force the update. Your students will receive a series of prompts when they log into Skydrive and open a file. They must click Yes to be able to print and download. Share files with your students using OneDrive. Windows Live OneDrive is part of Microsoft’s Windows Live range of online services. OneDrive is a file storage and sharing service that allows users to upload files to the computing cloud, then access them from a web browser. With a Microsoft account you get 7 GB of storage space for FREE! (Extra storage available for purchase). Installing an optional desktop app lets you synchronize that storage with the hard drive on your PC where you can manage files using Windows Explorer. Optionally, you can open your OneDrive account with web access and upload the desired file(s). This may be the best option for use with students on a managed network. The most common use for OneDrive is personal file backup. Keeping your important files in a folder that is continually synchronized with an online storage service gives you a backup security blanket. If your local drive crashes, you can recover those files quickly and easily. Another benefit is that OneDrive allows you to access files easily from multiple devices. If you have a desktop PC and a notebook, for example, you can start working on a file in your office; any changes you make are synchronized to the online copy. Then head home, grab your notebook and pick up where you left off—as long as you have access to an Internet connection. Since OneDrive allows access from mobile devices, you can even accomplish the same task with a tablet or a mobile phone. OneDrive offers the ability to create and edit a variety of document types (Word, PowerPoint, Excel, and OneNote) directly in a web browser using Web Apps. Online viewing and editing means you don’t need to worry about whether you’ll have the right app installed—if you can open your online file storage location in a browser, you can get your work done. This feature lets you easily share a file with another person (or a group of people). So if you’re passing around a presentation or a spreadsheet, each member of the team can make changes and add comments. The ability to set up sharing for specific folders and control access to those folders on a per-user basis makes it easy to share files online with co-workers and your students and/or their parents. Are you planning an event in your classroom? Maybe it is almost graduation time and you need to confer with a few other teachers in your school. Using OneDrive, you can create a Word document, PowerPoint presentation or even an Excel spreadsheet and share it amongst others. Giving them the option to edit the file will allow them to add comments or even add to the document. You don’t need to worry that all people in the group have the same version of PowerPoint or Word, by using the Web Apps, it is all the same. Even if the browser is different the apps are the same. At the end of the school year our Grade 7 students put together a presentation for the graduating Grade 8 class following the step-by-step instructions in TechnoTribute. Sometimes the number of Grade 7 students is less than the number of Grade 8’s and students need to collaborate to make sure there is a presentation for every grad. By creating a presentation and sharing it in OneDrive, the document can easily be edited by more than one user. Each student can add their slide and save the changes. The presentation can then be opened in the desktop application once back at school where it can be finished by putting on the final touches. This is a great way for students to work together when they can’t physically be in the same place. With hockey practice and piano lessons all taking place after school and on weekends, sometimes it is difficult to get groups together to work on a project. This would alleviate that and allow students to do their part when it is convenient. This is also a great way to provide homework sheets to students that may be absent for extended periods. As long as they have an email address and access to the internet they can view the files and keep up to date. Sharing photos in OneDrive is as simple as creating a folder and adding the content. Sharing them out is also quick and easy. Just select the folder that contains the pictures and click Share; add the emails of the desired recipients and you’re good to go. This would be a great way to share the latest photos of the class field trip or recent school event with parents. (Be sure you have permission from parents to share photos of their children within the school community).